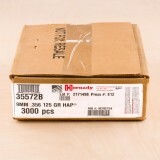 With this box, you’ll get 3,000 rounds of 9mm HAP bullets, which stands for Hornady Action Pistol. They are highly refined, making them the perfect competition bullet. They have no exposed lead, a swaged core for better balance, and a copper jacket that gives off less fouling in the barrel. These 125-grain bullets will help you become a more accurate and more successful target shooter. 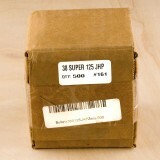 Odds are good you know Hornady - they've been creating innovative ammunition products since the 1940’s. 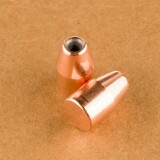 The are based out of Nebraska and create leading bullets for rifles and handguns. 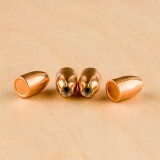 The 9mm is a top choice among law enforcement, target shooters, and anyone who wants a reliable tool for self defense. The cartridge delivers excellent speed and consistent terminal performance, making it a common round at target ranges all across the United States. If you shoot a 9mm round, you can reload your brass with excellent bullets from Hornady, one of the nation’s most innovative ammunition manufacturers. 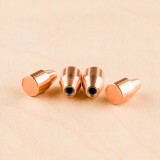 These jacketed hollow-point (JHP) projectiles from Zero Bullets are perfect for putting together match or self-defense load for your .38 Super handguns. 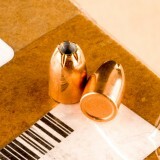 Zero Bullets, an Alabama-based manufacturer, constructs their JHPs using true copper jackets with segments cut at the junction of the hollow cavity. This facilitates more reliable expansion for wider wound cavities and greater terminal effect on target at a variety of speeds and distances. The hollow cavity up front also gives higher relative weight to the rear of the rounds for less flight deviation and more consistent accuracy. Don't forget to check out Widener's great selection of pistol powders, while you're here!